Orrville Red Rider Sports Blog: Riders beat Ironmen!!! How About That!!! 1. First and foremost...great effort by the entire team. To hold the lead in the 4th quarter with Jake AND Zach on the bench says so much for the depth of this team. We didn't sit on the lead and try to run the clock out. We kept attacking. Everyone had a big game and played their role to perfection. 2. Jake's half court shot at the end of the 1st was another chapter in his legendary career. Shot was good the second it left his hand. 3. I said Zach needed to have a big game, and he did just that. He played Anton Grady tough and held his own rebounding the ball. He's got a little point guard in him lately too. Always a heartstopper. He was clutch at the free throw line too in the 4th. 4. Thought the crowd was absolutely dead in the first half. Maybe it was the early start time, maybe it was our recent string of bad games at the Fieldhouse...I have no idea. But it's like our fans have kind of forgotten how to cheer. Seemed we were constantly waiting for things to go wrong in the 4th quarter. I know it's been a long time, and maybe we're a little gun-shy, for fear of a letdown....but we need to get behind these kids. 5. (Another) great coaching effort from Sly. There's good technicals, and bad technicals....and his technical in the 4th was certainly a good one, it helped that CCC missed both free throws. It got the kids fired up and showed them that their coach would worry about the refs. I also like him calming Andre Ingram down after his and-1. He could have gotten rung up for taunting, but Sly was quick to get his attention and refocus him. 6. 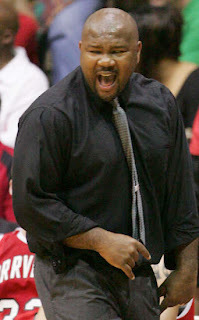 Cleveland Central was a real talented team...but no killer instinct at all. Anton Grady will play college basketball somewhere, not many 6'8" centers can handle the ball and shoot from outside like him. If he works on getting stronger and playing all game like he did in the 4th quarter, he'll be a great addition to a college team. 7. I wish Ironmen senior Chall Montgomery the best as he has chosen to commit to the US Naval Academy. Good luck young man. 8. Sure was disappointed in the fan support from the Ironmen following. I know private schools traditionally have small followings, but theirs was pathetic. Kids need to be supported in their endeavors, whatever they may be. Be thankful for the town you live in. 9. This is another giant we've slayed this year....we weren't supposed to come within four touchdowns of Genoa, but we beat them....and most outside of Orrrville thought CCC would win tonight. Nice to be known as a team that you just don't underestimate. 10. Dating back to 1992, Orrville has now won 6 of our last 7 regional games at the Fieldhouse (2 wins in 1992, 1 in '93, 2 in '95 and 1 tonight). For all the struggles we've had in the district round, we sure know how to win in regionals. 11. Jake's 20 points gives him 1107 for his career, good for 6th all-time in Orrville history, sandwiching Jake on the list are his father Tom (1277) and some guy named Knight (1104). Jake now has 487 points on the season, with 13 more, he'll become the 5th Red Rider to score 500 pts. in a season. 12. We now have 19 wins on the season, also the most since the 26 wins in 1996. Like I said before....lose and no one will remember you. But win, and no one will forget you. I know right now, the Ironmen know who Orrville is. Great win guys....but don't let up. Orrville Basketball is back!!! !